This soups works well with most vegetables from the garden-- experiment and use vegetables that are in season. This soups works well with most vegetables from the garden-- experiment and use vegetables that are in season. Chef Meg was inspired to create this meal after a trip to the farmers market. Be creative and use whatever vegetables you have on hand! Place 1 tablespoon olive oil in a heavy bottomed saucepan or stock pot. Once warm, add carrots, leek, and celery. Cook over medium heat for 5 minutes, stirring occasionally. Add garlic and thyme and continue to cook for 5 minutes. Add potatoes, spinach, salt, and red and black pepper; cook 3 minutes. 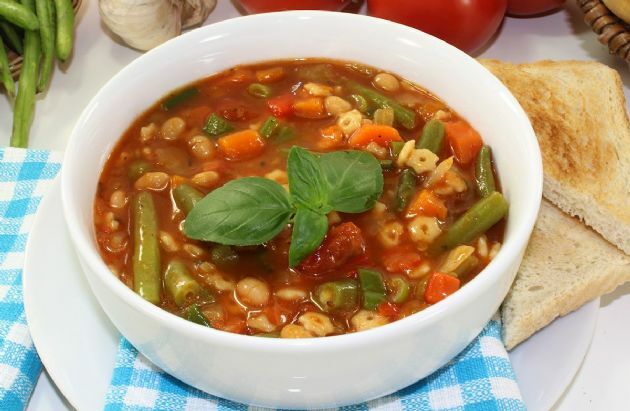 Add water, zucchini, beans, pasta, and tomatoes to the saucepan; cook an additional 8 minutes. While soup is cooking, place the basil, remaining oil and cheese in a small food processor; blend until smooth. Swirl basil mixture into the soup just until combined and serve. Recipe makes eight 2 cup servings.